Ranikhet is situated at a height of 1829 meters, and is also considered to be the ideal destination for holidays. This place is located is the midst of nature, and therefore, offers splendid views of nature. In addition to being a favourite spot for the nature lovers, it is also considered to be the ideal spot for trekkers. The picturesque beauty of the Himalayas can be best viewed from here, and the entire place is covered with oak and pine forests. There are plenty of places to visit here that attracts tourists from different corners of the world. Ranikhet is surrounded by thick and natural forests of oak and pine. This proves to be a major attraction of this place. Tourists can easily take a walk through the forests, and there is also an orchard located nearby, which is also visited by people at large. This is also a famous dam located around Ranikhet, and is visited by many people. Though there is little water in the dam, yet it is considered to be a tourist spot mainly because of the scenic and spectacular views offered by it. Ranikhet Golf Course is a 9-hole course and one of the prime attractions of Ranikhet. This Golf Course is one of the highest golf courses of Asia. Haidakhan Temple made by Shri Haidakhan Maharaj who is said to be the incarnation of Lord Shiva, the temple is dedicated to Lord Shiva. 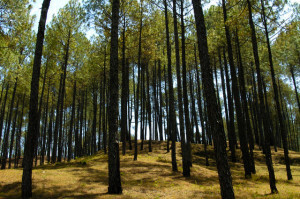 Situated just 4kms from Ranikhet town. Chaubatia is house of the botanical gardens and a fruit research institute. Located 10 Kms away from the town. known for orchards with more than 2 hundreds exotic varieties of fruits and flowers. The temple said to be the one of the oldest temples in Uttarakhand, Located 7 kms from Ranikhet on the Ram Mandir route to Chaubatia. The temples devoted to the Goddess Durga. The museum holds ancient war photos and memorabilia that relate to the Kumaon regiment. There are many weapons captured in various wars and coffin of General TN Raina. This is a small town located near Ranikhet, and is well known for the famous Kalika Temple, as well as, the golf course. In fact, this golf course is one of the major attractions, where there are links of nine natural holes. In fact, it is one of the best mountain golf courses located at a high level. This is also a small town located near Ranikhet, and is mainly renowned for the archaeological importance. Apart from that, this place has a historical importance, as well. There are plenty of temples located here, and the location of this place is in a beautiful valley of the Ram Ganga River. 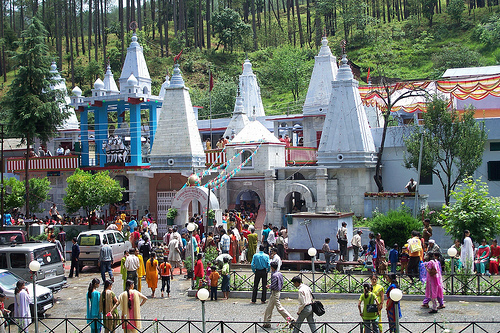 Binsar Mahadev Temple situated about 15 kms from Ranikhet. There is beautiful and fresh water stream flowing very close to it. Majhkhali known for an amazing view of crystal clear and snow-clad mountains. Situated on Ranikhet-Almora road, it is a must visit for nature’s scenic beauty lover. Ranikhet can be visited throughout the year, Ranikhet becomes very cold in the winters and gets snowfall mainly in the months of December, January and February. It remains moderate in summers, best enjoyed from March to October. The nearest airport is located at Dehradun and Pantnagar. Kathgodam is the nearest railway station. Ranikhet is well connected with other nearby cities in the region including Nainital, Almora and Ramnagar.